Optional local pickup (free) in the Portland OR area available. The top is slightly worn but still in good condition. GP Brand IBM Ball element w/case Courier 10 for Selectric I and II only. GP Brand IBM Ball Element Artisan 12 for Selectric I & II only. 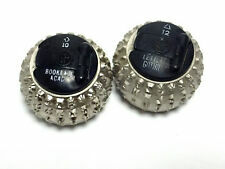 GP Brand IBM Ball element Orator 10 for Selectric I & II only. The top of the ball with model information is a little worn. These are for IBM selectric I & II typewriters. Font is Letter Gothic 12 pitch. These are for the IBM selectric I and II typewriters. Font is Light Italic 12 pitch. These are for the IBM selectric I and II typewriters. It was manufactured by GP technologies. It is a rare Pristige Elite font size 12. We will do everything we can to get you the best rate. Used GP Brand golf ball type element font Elite 12 pitch. These are for IBM selectric I and II typewriters. If you have any questions, please let me know. Thanks for viewing! These are for the IBM selectric I and II typewriters. Used GP Brand golf ball type element font Prestige Elite 12 pitch. These are for IBM selectric I and II typewriters. If you have any questions please let me know. Thanks for viewing! Used GP Brand golf ball type element. Font is Dual Gothic 12 pitch. These are for the IBM selectric I and II typewriters. I'd you have any questions, please let me know. Thanks for viewing!